Well made, water proof keyboard that can take rage quits and has personally out lasted the authors DasKeyboard! 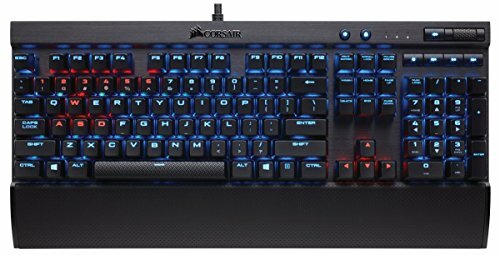 The new mechanical keyboard K70 RGB by Corsair is a favorite for programmers and gamers alike. We like the mechanical keyboard because the keys have a springy and precise feel to them. With the K70, Corsair has introduced the “Cherry MX Speed” keys, which definitely have enhanced the keyboard experience. Key Type: There are a few extra features we liked on this keyboard, starting with the macro keys, MX Speed buttons, and media keys that distinguish it from the older version. The space bar is also textured, and the keys come with extra key caps to switch out. We found it to be very easy to switch out the key caps, making the change out quick. With the removable keys it makes everything easy to clean, especially since the keys are in an aluminum deck, with nowhere for dust and crumbs to go. Another plus is that there is 100% anti-ghosting and 104 key-rollover on USB. We loved how responsive the buttons were, and the keys seem to be quicker and more responsive than other keyboards we have tested. Lighting: The backlit RGP keys are very bold and bright, which can be a bit distracting but also useful in one is accustomed to playing in dimly lit or darker rooms. Corsair does provide a utility engine to mess with the back lighting. The keyboard has full spectrum color in this utility link. This will allow you to connect the keyboard, mouse, and headset, making the lighting experience quite unique. The default lighting schemes are pretty simple to modify, but anything more complex would take a lot of time to change. The possibilities with the CUE are unlimited. There is a full suite of programming options for lighting effects. You can use as little or as much of this robust utility as you want. There is also an option to turn the lighting off all together if it becomes too much of a distraction. Build Quality: The aluminum board that the keyboard is made of feels heavier and more solid than that of average keyboards. In fact, it is aircraft-grade anodized aluminum, making it very durable. We found that we could use it just as easily at the office as we could as a keyboard. It is very sturdy and can withstand a lot of abuse. The USB cords are braided, making them less susceptible to tangles, but this also means that they don’t fold away very easily. One cord is a USB pass through, which if not needed will just hang there. Corsair’s LUX line of keyboards for gaming are often in the top 10 list of many reviews. There are three types of Cherry MX switches to choose from, and all are designed to match your play style. Especially with their large front key caps and programmable lighting schemes, this has the potential to up your gameplay with the on-the-fly macro programming. The Rapidfire features are great to use, and makes good use of space, letting the keys have room. The textured wrist wrest was also a big plus, as it can come on and off at your whim. The media buttons are very discreet, and there is an option for ‘game mode’, which disables keys that could interrupt gameplay. The keyboard comes in at 18.6 x 8.3 inches, so it isn’t small by any means. However, it does make good use of space. It gives the keys breathing room, which is great if you like to not have your fingers cramped together during play. It also has the large detachable wrist wrest. The big difference between the standard RGB and the Rapidfire is the alternative textured keys. These keys helped us immensely during gaming. If your fingers get sweaty from intense gameplay, particularly from first person shooter matches, the textured keys ensure you always know and feel which buttons you are pressing. We were very happy with the performance of the Corsair K70. The extremely responsive Cherry Red keys make for accurate and fast typing. The soft touch on the surface of the keys makes for a good grip for all those long gaming sessions. The labeling on the keys as well as the backlighting on the keyboard really made it easy for us to see a clear readout. The contoured keys aren’t as clear, as they don’t display the secondary function of the particular key. We found the backlighting on the media keys to be a little weak, but this is not a huge issue. The contoured keys were our favorite part of the keyboard, and they worked really well. They provide the right amount of tactile cue, which in turn made it easier to locate and relocate the right finger position when in the middle of a game. Most Corsair K70 RGB reviews have it listed as being one of the fullest featured keyboards for e-sports on the market. The responsive switches and lighting are huge pluses as well. It also performs better than most keyboards out on the market. The main downside to this keyboard was the lack of programmable G keys, but those are necessary for all gaming situations. If you’re buying the keyboard for gaming or for typing, you really can’t go wrong with this model. But if you're still looking for other models, check out our review of the best gaming keyboards for 2018.